Who doesn’t love catching a film in the theatre? Right? But with ticket (and snack) prices going ever more through the roof, a night out at the movies with the family can easily cost half a fortune or more. So, why not think long-term and spend all that money on your very own movie room instead? So what’s a movie room? And why not simply sticking with what you already have and simply re-name your living room? Well, compared to a movie room, a living room serves quite a few more purposes – it is, as the name says, a place to live. 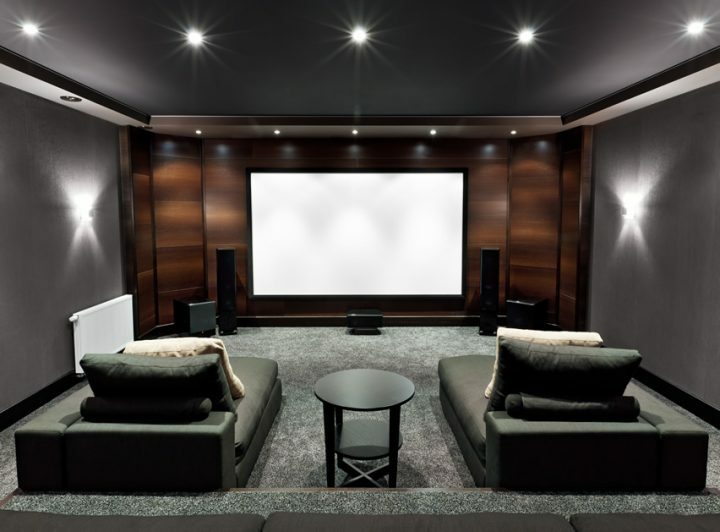 Generally speaking, a movie room needs three main ingredients marking it as your home theatre: a large-scale screen (typically a real screen and not just a large TV), a good sound system (as fancy as you want, but at least dolby surround) and comfortable theatre-like stadium seating (luxurious recliners, often done up in the iconic red velvet, are often seen classics, but others prefer sofas, bed-like lounge areas, or other types of seating). Depending on the room’s size and your individual preferences you might want to add a popcorn maker, a (small) bar, or whatever else suits your snacking in drinking need while watching your favourite movies. In order to kickstart your imagination, we have collected some of the greatest home movie room examples we came across. Enjoy the inspiration, and… Action! Wine Cellar? Movie Room? Both! 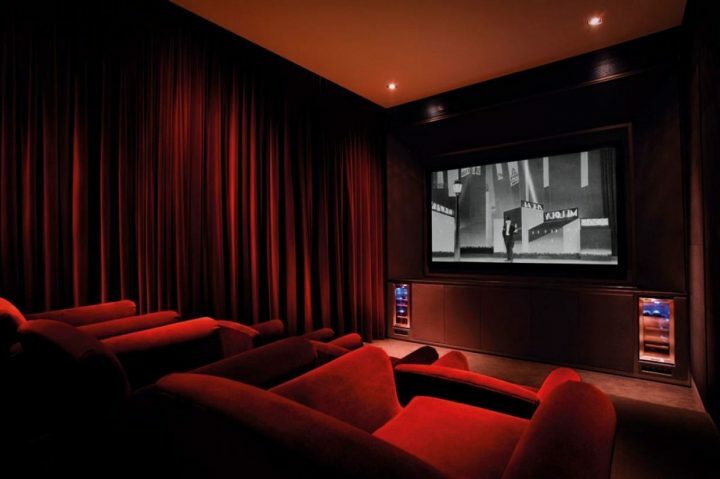 This gorgeously designed movie room is a real looker. The large screen is mounted on a semi-curved wall, giving it a unique look that suggests it is actually located above a window-seat. Additionally, the clever star-like lighting set into a pretend skylight gives lovely minimal illumination for when the main lights are out and the film is rolling. In terms of seating, the two main leather sofas with matching ottomans are a nice twist on the classic theatre seating, and additional leather recliners further back offer additional seating space. 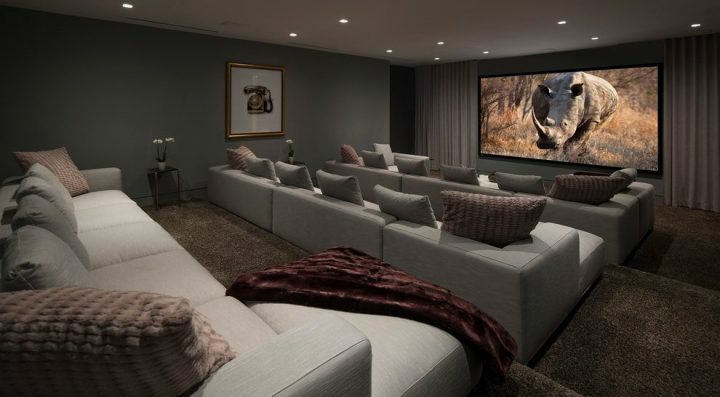 This beautiful movie room makes the most of the notorious non-colour grey. Slate grey walls, matching curtains, and the light grey sofas and ceiling create a unified whole that looks quite simply stunning. The reduced colour-scheme and clear lines of the furniture create a modernist style that we absolutely love. Add in a few splotches of (subdued) colour with light rosé pillows, darker blankets and a grey-brown soft carpet, and you’re fit to host the most exclusive Oscar-party outside the actual Oscars! You have an impressive wine collection and are a movie buff? Why not combine those two passions? While this movie room certainly is a stunner and looks incredibly inviting with the chase lounge-type seating, what really draws the eye (as long as the film is not running!) are the lovely wine racks set into glass cabinets that line the walls in window-like fashion. We’d love to drop by for a glass and a good movie! Despite what we said in our opening paragraphs, it doesn’t always need to be the big screen to mark a room as your movie room. This example makes the most of what (most likely) has already been there – a TV screen. Set into black wall panels with light cut-outs (that probably house the sound system), even a regular TV gets that special “at the movies” feeling. And if you’re still undecided about the purpose of the room, the red curtains covering the walls undeniably make this room into a home theatre. What’s particularly interesting in this design is the unconventional choice of seating. Instead of the more typical stadium-seating, this owner has chosen to provide piles of (body) pillows that couldn’t look more comfortable and inviting if they tried. 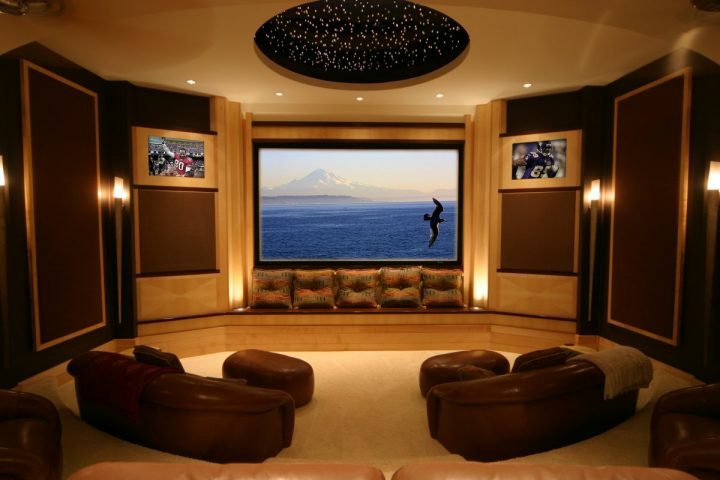 You can’t be more classic than this movie room example! With the whole room, including wall curtains, and movie recliners done up in red velvet, there’s no doubt about which room you’re in and what purpose it serves. This movie room is in classic theatre style, and couldn’t be more beautiful. 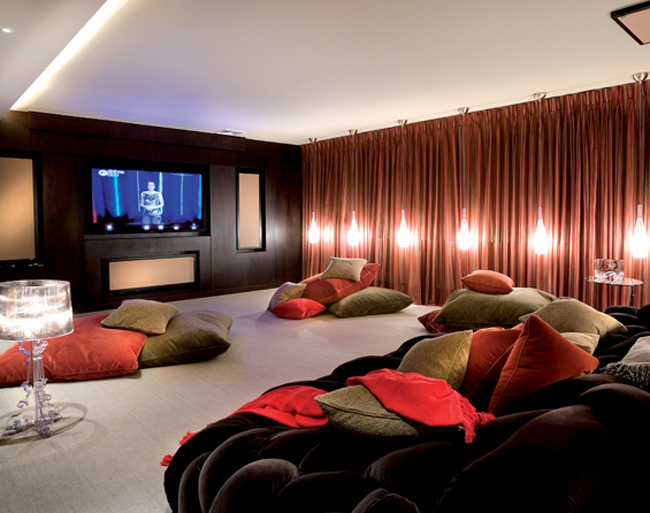 And what’s more – it shows that you don’t need a huge spare room to fulfil your dream of a home cinema. A small room, done right, can be just as perfect! And while this is a very traditional cinema-style, there’s still that small contemporary detail of the two mini-fridges incorporated into the wall holding the screen. This is not a classic movie room in the sense of having a separate, enclosed home theatre. 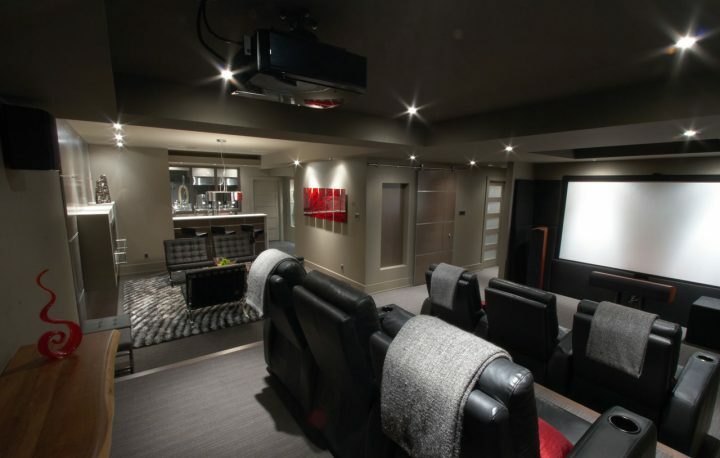 This is, however, a great way to combine a man-cave, a game room, a media room, and a stylish house bar into one big basement entertainment centre. The large screen and theatre stadium seating is the heart of the movie room, and just looks wonderfully comfortable with its leather recliners, and soft grey blankets at the ready. The adjacent bar boasts all the amenities you could wish for in terms of drinks and snacking possibilities, and offers an additional seating area. This room might not offer the absolute seclusion a dedicated movie room would grant you, but it is a great way of making the most of your available space, particularly if you want to use the screen not only for viewing movies, but as a multimedia centre, games room, and the like as well. This is another example for how you don’t need an enormous spare room to create a stylish and highly comfortable home theatre. As you can see, the room is rather small in terms of width, but the interior design makes the most of that narrow rectangular space by utilising incredibly cozy chaise lounges instead of traditional theatre seating. You don’t need a row of seats to watch movies in style, and this home theatre clearly proves that! Just as it doesn’t always have to be a huge movie room, it doesn’t always have to be fancy seating, or rather, it doesn’t have to be fancy store-bought seating! If you’re somewhat talented as a craftsman (and really, you hardly need more than the ability to wield a screwdriver to build this) you can easily DIY your perfect stadium theatre seating with a few wood pallets and some comfortable mattresses or thick body cushions. 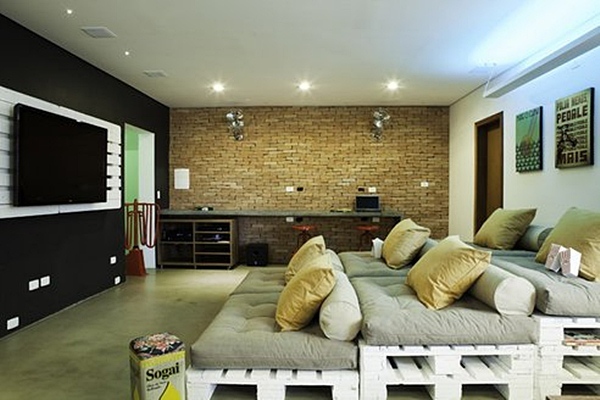 Homemade pallet furniture is all the rage at the moment anyway, and this clever project not only gives you the opportunity to furnish exactly the kind of seating you want and that is custom-built to exactly fit the available space, but the pallet furniture, by its nature, gives you ample storage space inbetween the individual pallets – Just what you need to stash some yummy chocolates or that bag of sweets you just can’t watch a film without! You want your movie room to keep with the classic style, but also want to put a bit of a twist on the tried and tested decor? Then this lovely art deco inspired home theatre is exactly up your alley! The beautiful light-pink velvet theatre seating fits in perfectly with the matte-grey and beige walls, curtains, as well as with the super elegant golden light fixtures. 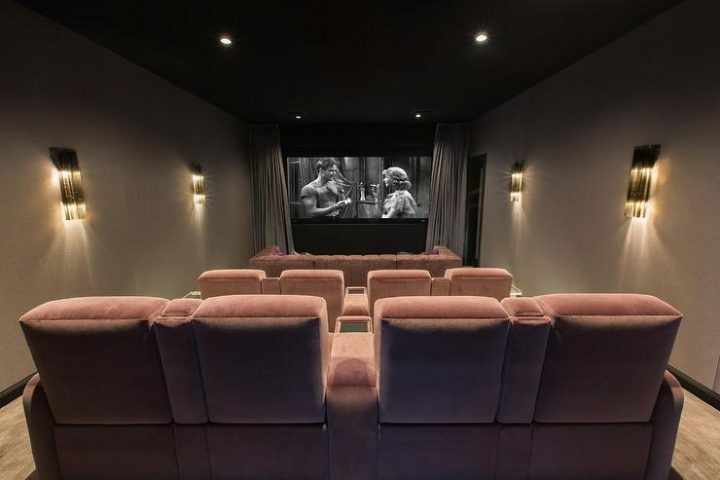 Tasteful, traditional, and trendy, this home cinema design makes the most of a classic theme and is stunning in its muted elegance. 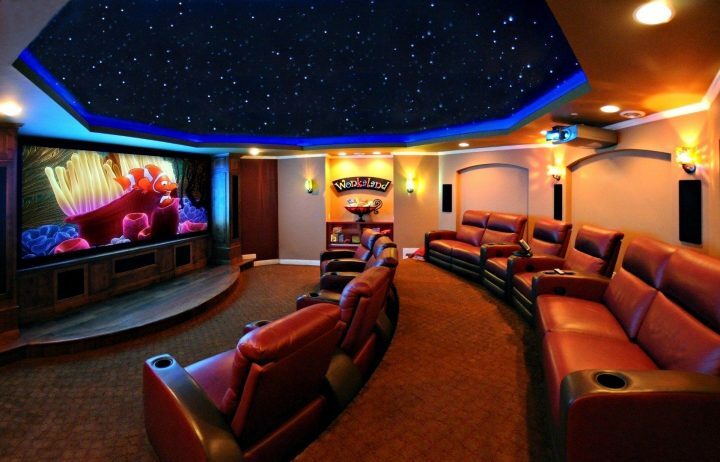 This amazing home movie room has everything you could want – and then some! With its ringed theatre seating, a truly enormous screen (with a little stage for added authenticity), and an aptly named snack bar (Wonkaland? Really? Too cool! ), this is the be all, end all of stylish, family-friendly home theatre. And the cherry on top? The truly amazing “night sky” skylight that doubles as dazzling indirect (muted) lighting when the main lights are off.